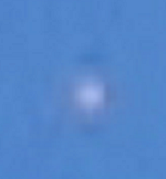 Latest UFO sightings – Daytime UFO / Orb was recorded in the sky over California, USA on Saturday, 12th June 2010. Real UFOs on net from north America, CA, The States. Sitting at the pool on 6/12/2010 with my girlfriend and 3 neighbors. We noticed a white object in the southern sky hoving and slow moving towards the south. 1st thought it might be a ballon but wasn’t gaining altitude. Happened to have my camera and took a short film of it. Then went back to enjoyng my day at the pool not thinking to much about it. Then a friends said that is was still in the sky. So I grabbed my camera again and took another short movie. By this time it seemed to move further south away from my location, but noticed that I had a near by tree that I could use during the 2nd movie to give it depth. Object was een by five different people at the same it. Unknown daytime object was seen and filmed over north Hollywood in Los Angeles, CA 29-Aug-2010 Spherical UFO over Westminster, California 15-Aug-2010 Daytime sphere or orb hovering in Californian sky LUS 2010 on abc News10 – Sacramento UFO sightings on the rise?